A web that passes through infinite intergalactic spaces, a dense cosmic forest illuminated by very distant lights and a huge enigma to solve. These are the picturesque ingredients of a scientific research — carried out by an international team composed of researchers from the International School for Adavnced Studies (SISSA) and the Abdus Salam International Center for Theoretical Physics (ICTP) in Trieste, the Institute of Astronomy of Cambridge and the University of Washington — that adds an important element for understanding one of the fundamental components of our Universe: the dark matter. In order to study its properties, scientists analyzed the interaction of the “cosmic web” — a network of filaments made up of gas and dark matter present in the whole Universe — with the light coming from very distant quasars and galaxies. Photons interacting with the hydrogen of the cosmic filaments create many absorption lines defined “Lyman-alpha forest.” This microscopic interaction succeeds in revealing several important properties of the dark matter at cosmological distances. The results further support the theory of Cold Dark Matter, which is composed of particles that move very slowly. Moreover, for the first time, they highlight the incompatibility with another model, i.e. the Fuzzy Dark Matter, for which dark matter particles have larger velocities. The research was carried out through simulations performed on international parallel supercomputers and has recently been published in Physical Review Letters. Although constituting an important part of our cosmos, the dark matter is not directly observable, it does not emit electromagnetic radiation and it is visible only through gravitational effects. Besides, its nature remains a deep mystery. The theories that try to explore this aspect are various. In this research, scientists investigated two of them: the so-called Cold Dark Matter, considered a paradigm of modern cosmology, and an alternative model called Fuzzy Dark Matter (FDM), in which the dark matter is deemed composed of ultralight bosons provided with a non-negligible pressure at small scales. To carry out their investigations, scientists examined the cosmic web by analyzing the so-called Lyman-alpha forest. The Lyman-alpha forest consists of a series of absorption lines produced by the light coming from very distant and extremely luminous sources, that passes through the intergalactic space along its way toward the earth’s telescopes. The atomic interaction of photons with the hydrogen present in the cosmic filaments is used to study the properties of the cosmos and of the dark matter at enormous distances. Through simulations carried out with supercomputers, researchers reproduced the interaction of the light with the cosmic web. Thus they were able to infer some of the characteristics of the particles that compose the dark matter. More in particular, evidence showed for the first time that the mass of the particles, which allegedly compose the dark matter according to the FDM model, is not consistent with the Lyman-alpha Forest observed by the Keck telescope (Hawaii, US) and the Very Large Telescope (European Southern Observatory, Chile). 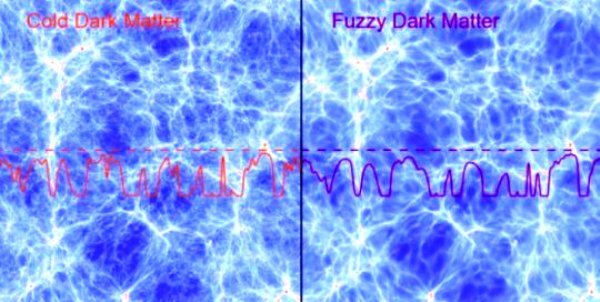 Basically, the study seems not to confirm the theory of the Fuzzy Dark Matter. The data, instead, support the scenario envisaged by the model of the Cold Dark Matter. The results obtained — scientists say — are important as they allow to build new theoretical models for describing the dark matter and new hypotheses on the characteristics of the cosmos. Moreover, these results can provide useful indications for the realization of experiments in laboratories and can guide observational efforts aimed at making progress on this fascinating scientific theme.